In related news, the sky has fallen. One of the greatest turnarounds in college athletics is occurring in the media capital of the world, and you probably haven’t heard about it.1 The Columbia Lions football squad sits at 4-0 and on top of the Ivy League heading into homecoming against the University of Pennsylvania Quakers on Saturday. To say its undefeated start is shocking would be an understatement. Just three years ago, I wrote that Columbia was taking part in the worst college football game of the year. The 0-8 Lions were hosting the 0-8 Cornell Big Red in Upper Manhattan. Columbia would lose that game 30-27 and finish the year 0-10. That season was part of a 24-game losing streak, which one might call a baby version of the Lions’ 44-game losing streak in the 1980s. So how the heck did the constant losers turn it around and make this Lions fan2 very happy? It all started when the school hired former Quaker head coach Al Bagnoli in 2015. 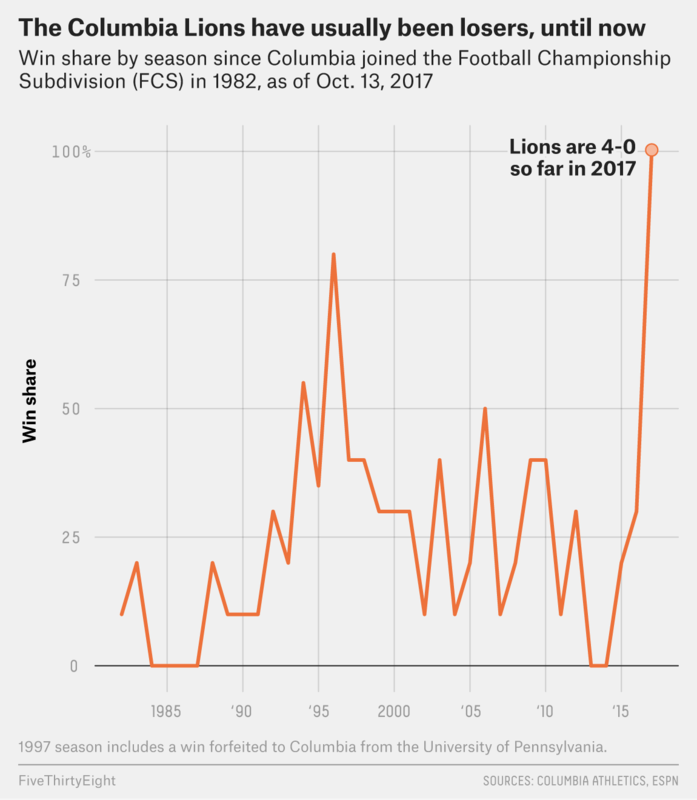 The team has progressed incrementally since then, and a look at the stats reveals that Columbia has improved in nearly every facet since entering the game against the Big Red three years ago. Simply put, the Lions are scoring a lot more points than they did then. Heading into that game against Cornell, they were dead last (out of 121 teams) in the Football Championship Subdivision (FCS) with just 8.6 points per game. They had scored more than 7 points only once. But through four games this year, the Lions have scored at least 17 points every game and have put up an average of 30.3 points per game. That ranks 35th out of 123 teams. The main cause of the offensive explosion has been an improvement in the passing game. Three years ago, Columbia ranked 52nd with 221.6 passing yards per game (YPG). This year the Lions have jumped to 21st with 276.8 YPG, thanks in part to the strong play of senior quarterback Anders Hill. Of course, as I pointed out in 2014, Columbia was always so far behind that year that they needed to pass pretty much all the time. In passing efficiency — which takes into account completion percentage, yards per attempt, touchdown rate and interception rate — Columbia has jumped from 120th to 21st. Although the rushing game hasn’t improved anywhere near as much as the passing game, Columbia has shown it can move the ball on the ground. Heading into their 2014 game against Cornell, the Lions averaged just 51.3 rushing YPG. Again, that was dead last. This year, they’re up to 68th place with 136.0 YPG. As anyone who has ever watched football can tell you, the ability to both pass and run the ball gives you a better opportunity to fool the defense and score more points. On the other side of the field, the Lions put one of the worst defenses in the country on the field just three years ago. They were giving up an average of 273.8 rushing YPG (120th worst in the FCS) and 246.9 YPG (100th worst). It’s tough to win football games when you can stop neither the run nor the pass. This year, Columbia is doing a good job of stopping both. The Lions are giving up only 121.8 rushing YPG (32nd least in the FCS) and 194.8 passing YPG (39th least). In total defense (which combines both of these), Columbia ranks 26th for the least yards by giving up 316.5 YPG. That has allowed them to give up the 17th least points per game overall at just 17.3. The Lions have also excelled at special teams, where their kicking, punting and return games have all improved dramatically.3 And they have a point differential average of +13.0 points per game, which is 16th best in the country. That’s 44.2 points better per game than when they had a -31.2 point differential that ranked 118th when heading into their game against Cornell in 2014. So can this streak continue? Columbia’s season is not even halfway to completion. The rest of the games are against Ivy League opponents, which will help to determine whether Columbia wins its first league title since 1961. The team has had a little luck on its side. The Lions seem to be doing a little better on third down than their overall offensive and defensive ranking. Such success usually reverts to the mean. I’d also be worried about the fact that they rank 92nd in fewest penalty yards per game. Older Columbia fans may remember that a pivotal Marcellus Wiley penalty hurt the team dearly in its unsuccessful bid for a perfect season in 1996. Even so, Columbia is off to an impressive start. It’s been strong in all facets of the game — offense, defense and special teams. Other New York area football teams (OK, mainly the Giants) could only dream of doing so well. I went to every home game from 1994 to 2000 and still attend at least one game a year. Three years ago, Columbia made just two field goals in its first eight games and was ranked 111th and 75th in average yards per kickoff and punt return, respectively. This season, the Lions have already made three field goals in four games, and are ranked 23rd in yards per kickoff return (with 23.27) and 13th in yards per punt return (with 13.00).